Throughout the endless reaches of space are myriad clusters of innumerable stars, with colours amazingly beautiful. We wonder whether the world famous scientist, Stephen Hawking, is hopeful that a unified theory of everything will, or can, be found. In an interview with the editors of the American science journal ´Discover´, he admitted that there are so many mysteries and fundamental contradictions in the universe that resolving them is unlikely to be possible, and even if they could be explained, they will be beyond human comprehension. It is not surprising that ´New Scientist´ should recognise our intellectual fallibility too. Over the past forty years the science they publish has changed greatly during that time. Now fascinating research papers and books are being published on teleology (evidence of design) which was a taboo subject. The unfortunate reality is that it is the media – print, radio and especially television – that give the impression that scientists can explain everything. There is an alternative point of view to that of the evolutionist. It is based upon the belief that God is the designer and creator of the world in which we live. Of course as Bible believers (many are scientists too), we are fully aware that we cannot explain everything either. The writer of Psalm 8 admits that there was no intellectual way he could resolve the fundamental mystery of how the Creator of an incomprehensibly vast cosmos could feel love and compassion towards a minute, mortal speck of briefly animated dust. Nevertheless, His love is so great toward us that He gave his One and only Son. 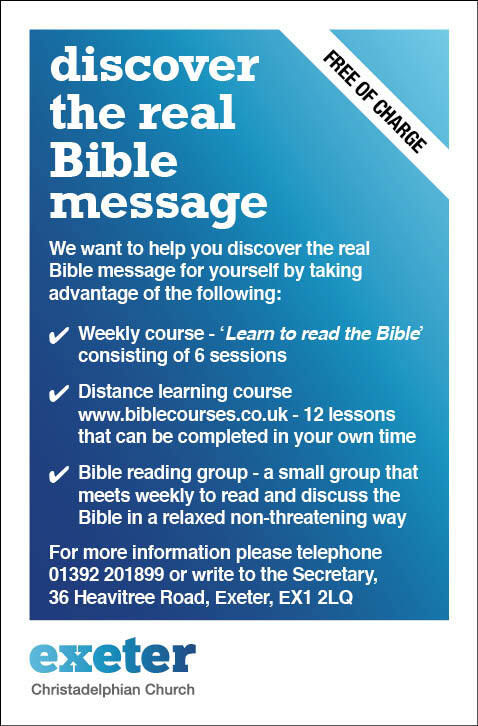 We are happy to chat or mail to you, free of charge on request, a monthly magazine Glad Tidings and/or pamphlets on Bible subjects.